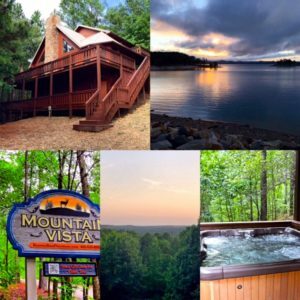 Beavers Bend State Park and Broken Bow Lake Corporate Retreats. 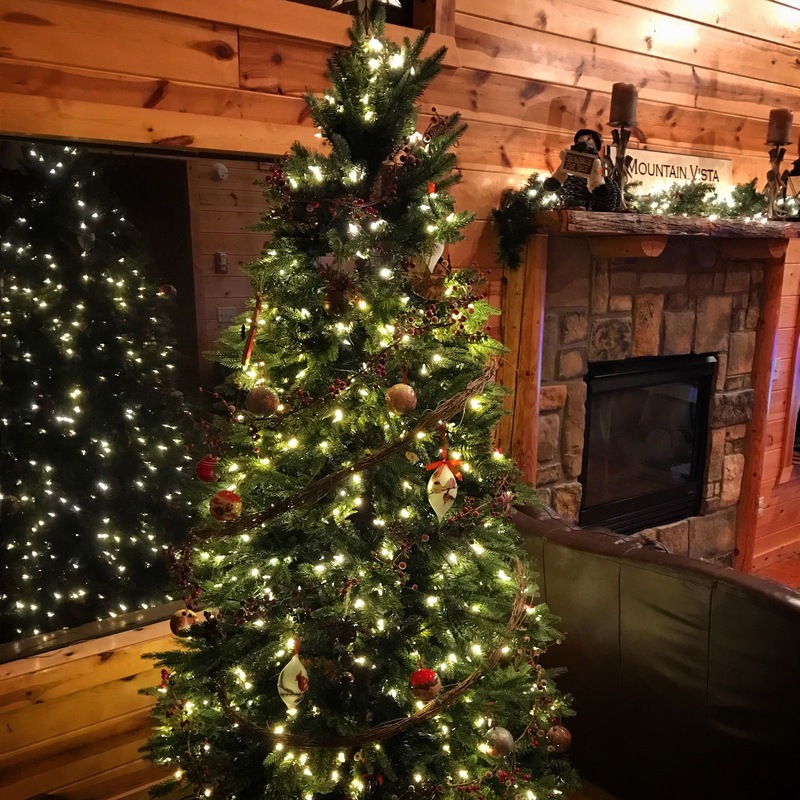 Beavers Bend corporate retreats have become increasingly popular in Broken Bow, OK.
Scores of luxury cabins and beautiful scenery will give a chance to refocus and recharge. We’ve had many corporate retreat visitors at Mountain Vista luxury cabin and can help plan your activities. 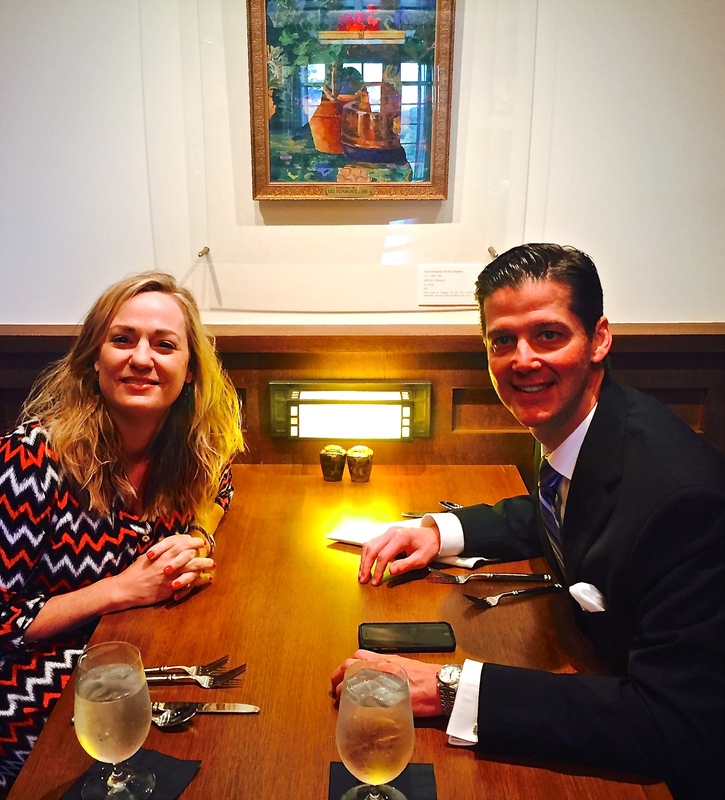 Peter Muir, President of Bizucate, is my long-time friend and a corporate training expert. He feels it’s imperative for organizations to get away from the office and learn in different environments. Imagine zip lining through the Kiamichi Forest or racing across Broken Bow Lake in a bass boat with a tremendous fishing guide. Your employee retention and performance will be enhanced after training and team-building exercises. I’ve been around hundreds of corporate trainers during my career…$20,000/hour, $20/hour presenters and everything in between. None hold a candle to Peter Muir. I’ve been fortunate to spend time with him throughout the United States on numerous occasions. Muir has the global reputation of delivering the perfect educational trifecta during presentations. He’s a technology expert while also being creative and entertaining. A rare feat for corporate trainers. “Get out! When is the last time you broke the cadence of what goes on in your organization so you can renew, rethink, regenerate and innovate? 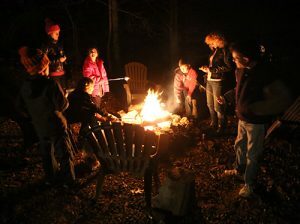 Three of the many benefits of a retreat are turning off, collaboration and renewal,” Muir said. 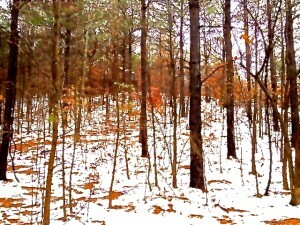 We can help plan your Beavers Bend corporate retreat and our app showcases the endless activities near Broken Bow, OK. If you need multiple cabins in conjunction with Mountain Vista, we can offer recommendations. Located three-hours from Dallas, the Broken Bow, OK region draws two million annual visitors. What will be your innovation in 2017? Break away from the same old routine, get creative, get out of the office and enhance your business. If you’re looking for weekend Beavers Bend activities during dreary weather, we have a few tips. We visited the great people at Mountain Man Meat Market and had their amazing seafood gumbo special. If you like friendly people and world-class gourmet meats, you’ll love this new Beavers Bend business. No morning is complete in Beavers Bend without stopping by Adam & Eve’s Coffee House. Owner, Pam Jackson, is constantly adding healthy dining options and her gift shop continues to expand. We almost bought her entire inventory of locally made soaps! Our favorite place in Beavers Bend is always hanging out with our friends at Moon Tower Bar and Grill. Chef Tabb Singleton, a two-time Food Network Champion, is always there to greet us with a smile and world-class cuisine. The chicken and dumplings were tremendous! We’re offering Beavers Bend fans a 20% discount on weekdays in January at Mountain Vista. 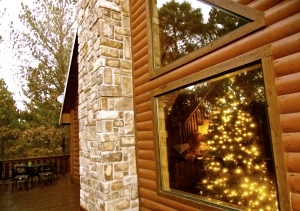 The winter months are a perfect time to visit Broken Bow while enjoying our fire pit and hot tub. Firewood is always free along with s’mores kits and other upscale amenities. You’ll never pay resort fees or incur additional add-on charges at Mountain Vista. Many cabins gouge guests with an additional 10% or more…not us! 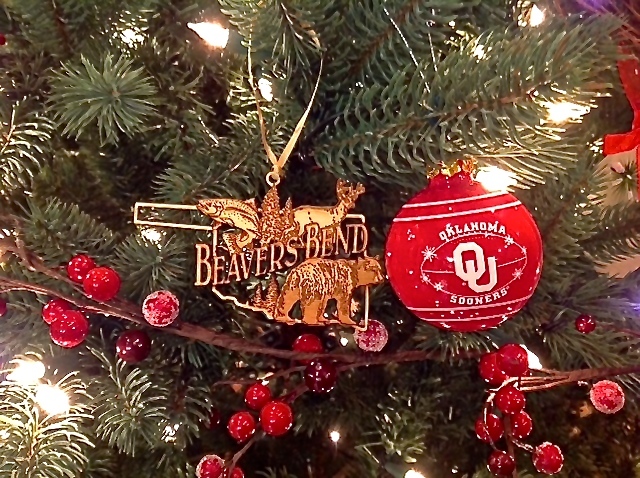 Another year of Christmas decorating is in the books at Mountain Vista in Broken Bow. 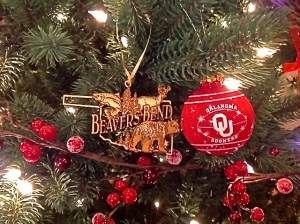 It’s a special time for us annually. 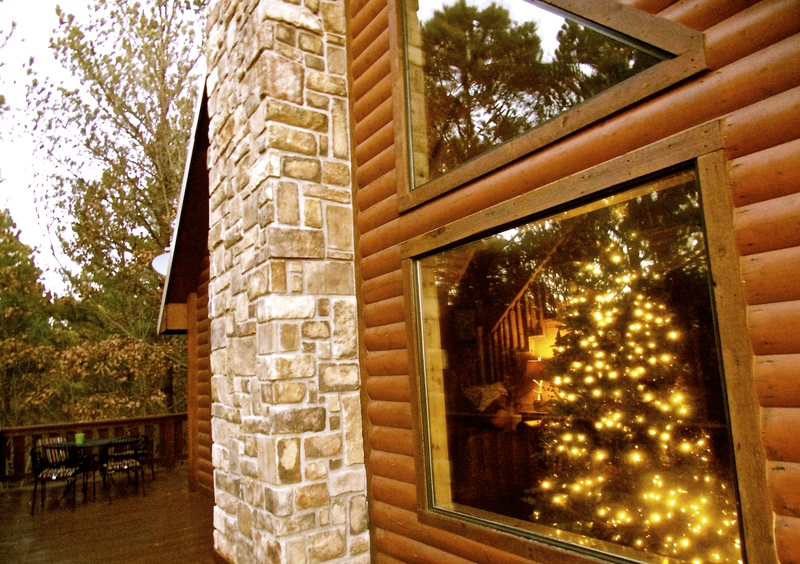 Our vacation home awaits wonderful guests during the holiday season. Enjoy your Beavers Bend weekend activities and make sure to visit Mountain Man Meat Market, Moon Tower Bar and Grill and Adam and Eve’s. Remember, there’s always something to do near Beavers Bend State Park…even in frigid weather. Need an elegant gift for someone during this holiday season? We have the answer! 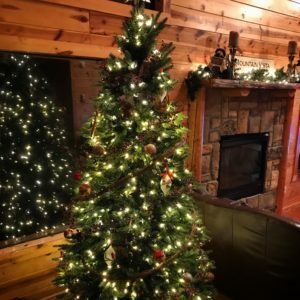 Beavers Bend Christmas gift certificates are available for Mountain Vista luxury cabin and our friend Bryce Archey at BrokenBowLakeGuide.com. January weekdays are 20% off at Mountain Vista. Always be on the lookout for resort fees when researching Beavers Bend luxury cabins. Many cabin companies are charging a 9% resort fee plus cleaning charges. We never gouge guests with these junk fees at Mountain Vista! Additional add-on fees include firewood, cleaning, hot tub and insurance charges. Download our Beavers Bend app for VIP special offers and Broken Bow Lake area information. 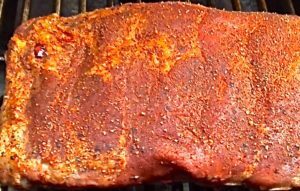 We’ve written about our friends at Spannman’s BBQ in Antlers for years. You must visit the award-winning BBQ champion chef when passing through Antlers on the way to Beavers Bend. He’s located on the main drag through town just down the road from Sonic. 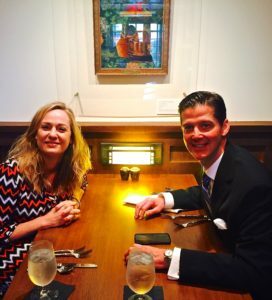 If you’re traveling from OKC or Tulsa to Broken Bow you’ll be amazed at this world-class cuisine. Tell Spannman we sent you. He’s been a great friend to us and Mountain Vista cabin. Mountain Vista’s Beavers Bend Winter Cabin Special has been announced today across various media platforms. Enjoy 20% off at Mountain Vista luxury cabin December 4-18 and during January 2017! 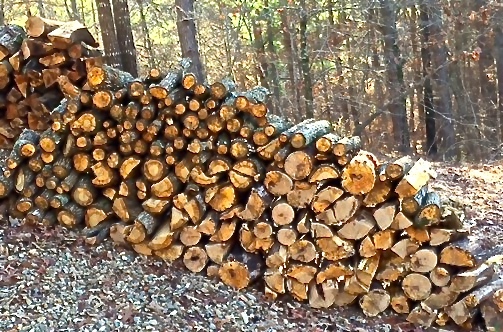 Other cabins in Broken Bow charge $100 or more for a couple of days supply of firewood…not us! It’s always free. You’ll never spend a penny around our fire pit for s’mores either. Our famous s’mores kits are also on the house at Mountain Vista. These aren’t simply generic junk…Sherri’s s’mores kits are vacuum sealed and always include a few extras like gourmet tea and Starbucks! Who else provides free Starbucks in Beavers Bend? Get our app for Beavers Bend tourist information. We hope you’ll take advantage of this special offer and enjoy one of Beavers Bend’s most spectacular views from our deck. 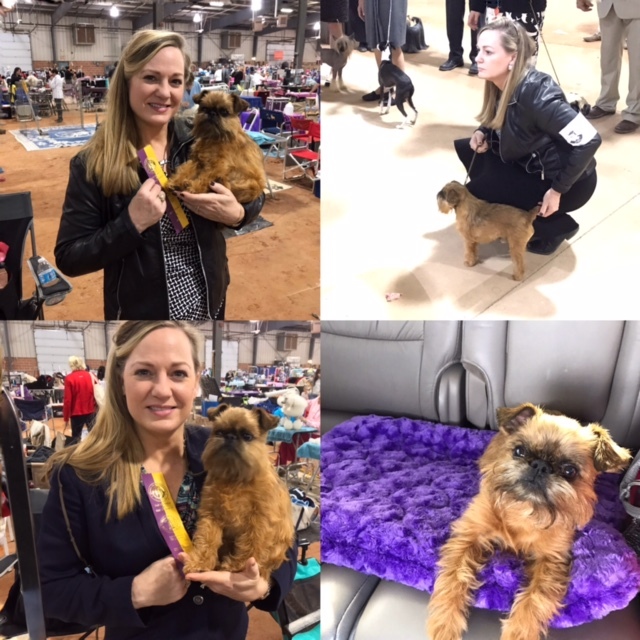 Beavers Bend’s most famous show dog finished this weekend’s AKC dog show in Chickasha, OK with two Best of Breed victories! As many of you know, we’ve been in the dog show world for two decades. When we’re not hanging out in Beavers Bend, we’re probably at a dog show with “Kula,” our six-year old Brussels Griffon. If you’re considering a new dog, AKC dog shows are a great place to learn about different breeds from the experts. That’s how we got started 20 years ago. Many of our Mountain Vista fans are from DFW and I’d recommend attending the Lone Star Classic December 8-11 at the Dallas Market Mall. It’s a huge show with well over 1,000 dogs. 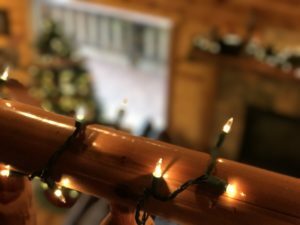 We currently have rare openings in mid-December at Mountain Vista and 2017 reservations are already occurring. It’s very important to make your 2017 holiday and spring break bookings soon. Happy Thanksgiving from Jerry, Sherri and Kula! 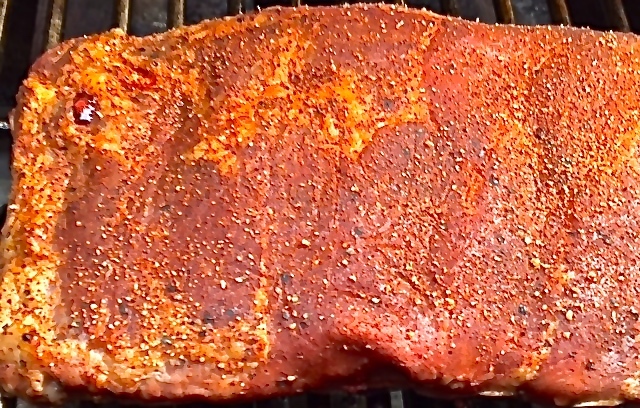 You must visit Beavers Bend’s new meat market during your next trip to Broken Bow Lake. 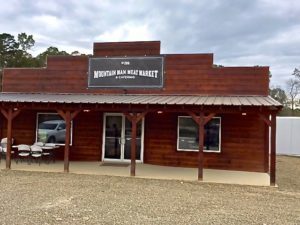 I met the owners of Mountain Man Meat Market and Catering recently and was blown away by their kindness and quality meats. I sampled their in-house smoked turkey and enjoyed a BBQ sandwich for lunch. They were fantastic! 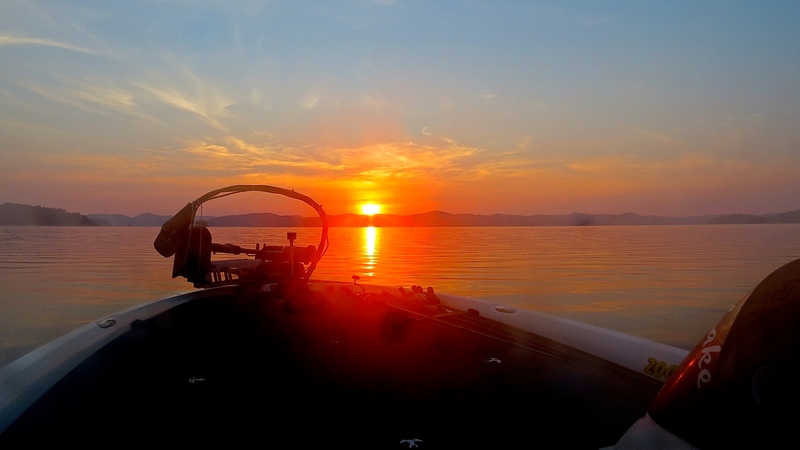 The owners moved to Beavers Bend from Mississippi after hard times hit the oil industry. They feature daily lunch specials and everything you’ll need to enjoy an evening of grilling at Mountain Vista cabin. Their ribs and pork chops were fantastic on the Mountain Vista grill and we look forward to seeing their business flourish. 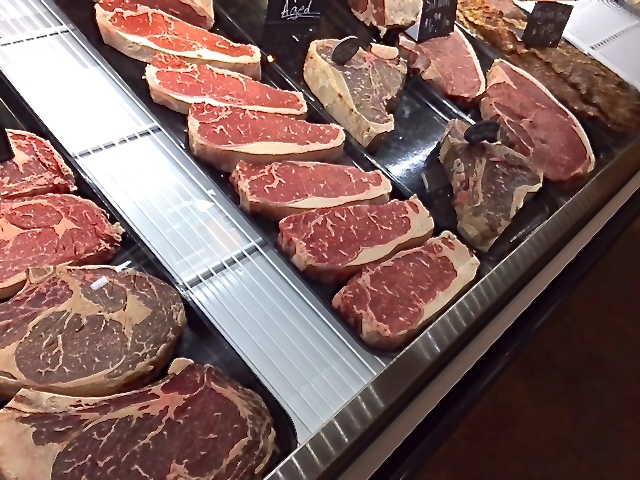 This isn’t your typical meat market…its gourmet and upscale cuisine. Grilling ribs at Mountain Vista! If you don’t feel like cooking yourself while staying in a Beavers Bend luxury cabin, take advantage of their catering service. 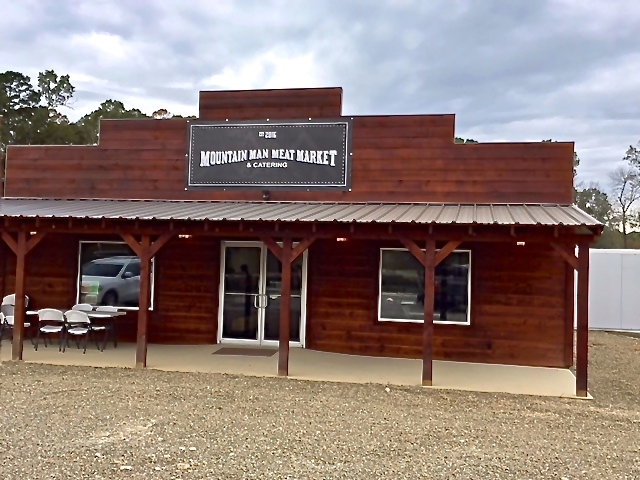 Mountain Man Meat Market and Catering is located about a mile south of the Beavers Bend exit on Highway 259. The oil bust has turned into a huge boom for Beavers Bend visitors. You’ll love their service and food! Beavers Bend firewood fees are becoming a source of frustration to luxury cabin visitors. We never charge guests a fee for firewood but most luxury cabins will gouge you with this add-on bill. Beware of the old “We provide you a starter supply of firewood” trick. We’ve talked with guests that have stayed at numerous cabins in Beavers Bend and the “starter supply” was only a few sticks. Unless you’re trained in the outdoors like Daniel Boone, it won’t be enough wood for an enjoyable fire. The per piece price of wood for an additional supply is usually outrageous from cabin management companies. You may want to consider bringing your own or purchasing wood from an area store. 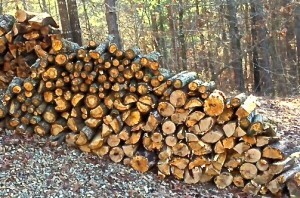 Firewood is very inexpensive for us to purchase in Beavers Bend. It’s also plentiful in our area. We see no need to slam our guests’ pocketbooks with this needless charge. Another bogus bill you may incur while staying in Beavers Bend is a “hot tub fee.” This is a relatively new add-on fee that has emerged in the luxury cabin market. Our staff cleans and sanitizes the hot tub at Mountain Vista between after every guest departs. Unlike many, we see no reason to charge a greedy hot tub fee. 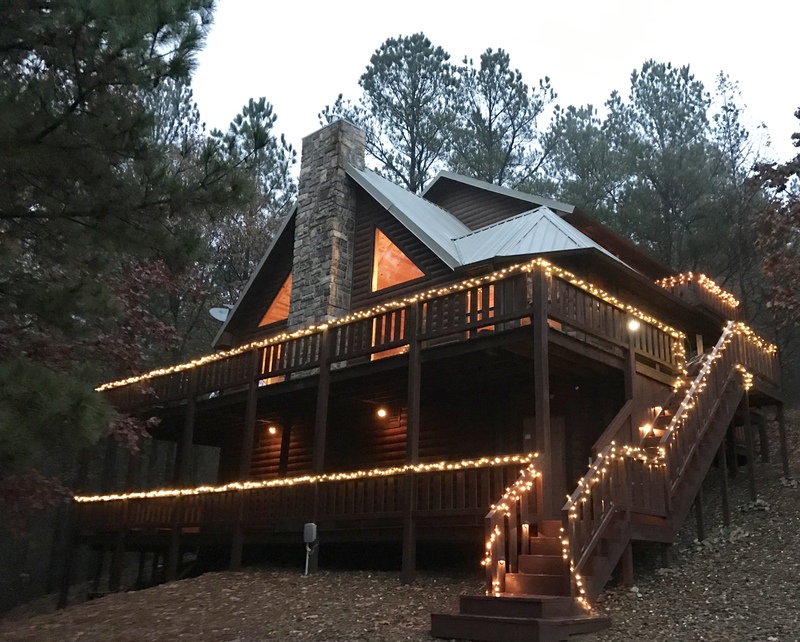 There are many other add-on bills to consider before agreeing to stay in a Broken Bow Lake area luxury cabin: Insurance, cleaning, resort and incidental fees have become popular charges in Beavers Bend State Park. We never charge add-fees at Mountain Vista. Make sure to do your homework and choose a luxury cabin that’s right for your group. There are many reputable cabin companies in the area and others that pop your pocketbook with these needles charges. We only have two available fall foliage season dates available. November 6-9 and 13-17. The peak foliage will be amazing as always in the next few weeks. Contact us at Mountain Vista to reserve your stay. Remember, you’ll have no Beavers Bend firewood fees with us! 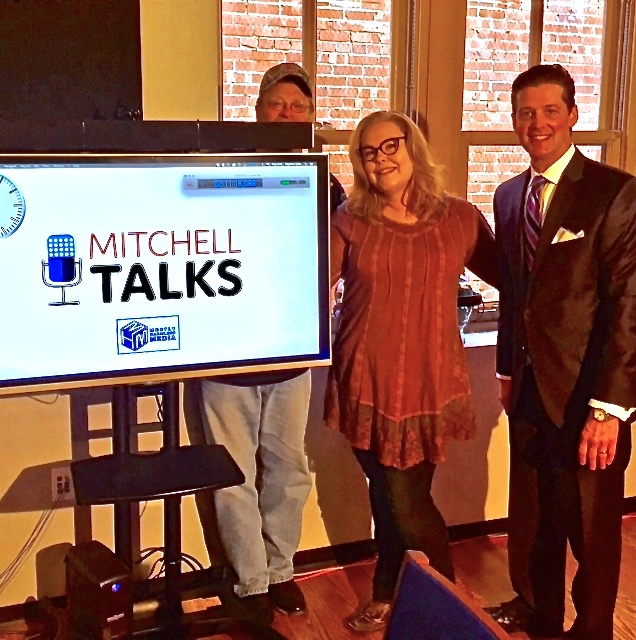 I enjoyed my appearance on Mitchell Talks in OKC. We taped this podcast and discussed Broken Bow Lake, fall foliage and Beavers Bend State Park. 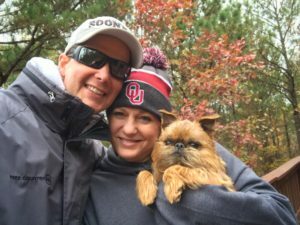 Scott (@MitchellTalks) and Kandyce (@KandyceMitchell) have been highly visible in the Oklahoma City media market for years. Scott and Kandyce provided tremendous hospitality in their beautiful studio…tremendous people. As a political junkie, I’ve enjoyed watching Scott on KWTV and listening to his radio show for years. I’m was on-air with Kandyce and Andy Moore (@andyokc). I love the podcast format. It’s a relaxed medium with no time limits or commercials. It’s simply coffeeshop conversation. We discussed tourism in Beavers Bend State Park and add-on fees you should avoid when choosing a rental property throughout the country. Thanks to the gang at Mitchell Talks. Enjoy the podcast. 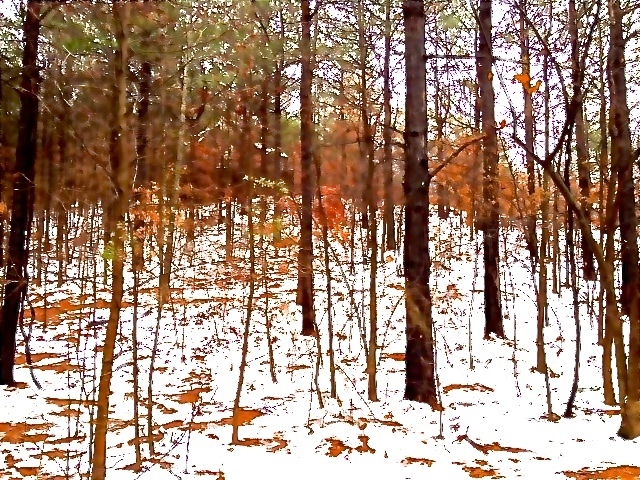 I hope you learn something new about the Broken Bow Lake area. The TravelOK Mountain Vista giveaway was just announced! Enter to win a two-night stay at our vacation home in Beavers Bend State Park. In addition, you’ll receive a $100 gift certificate to the famous Moon Tower Bar & Grill. Our soothing hot tub, plush accommodations and 20-mile views of the Kiamichi Mountains are awaiting you. There’s nothing like relaxing with a glass of wine and enjoying sunsets from the deck of Mountain Vista. I’ll make sure the two-time Food Network champion chef, Tabb Singleton takes great care of you. Thanks to TravelOK for always doing a fantastic job of promoting tourism in Oklahoma.